for visitors to the hatchery to get to meet and get to know personally. The sturgeon is a "prehistoric" fish. This means that it has changed very little since the earliest fossil records. Its appearance even suggests an echo of dinosaurs in its sets of boney plates that make it look something like a sea-going stegosaurus. Sturgeons are best known for their roe, or fish eggs, which are made into caviar. 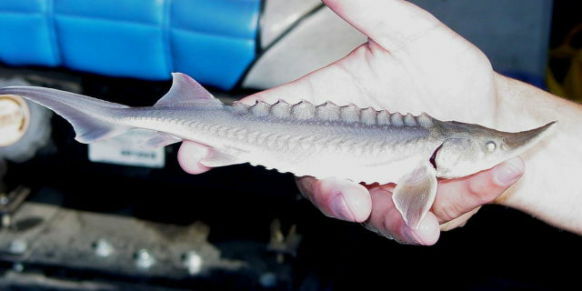 The White Sturgeon is found all along the Pacific coast of North America. Because of overfishing the fish is at risk for extinction. 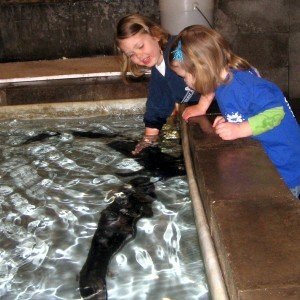 Freshwater Farms received their sturgeon 20 years ago in a shipment from Oregon when they were just five inches long. Since sturgeon live to be over 100 years old they are still in their prime. In the intervening years sturgeon have vanished from that area of Oregon. The hatchery is also the temporary home for a group of Lake Sturgeon from a group raised at The Ohio State University after they ran out of room. This is not at all surprising considering that both of the fish can grow to be over 20 feet long and weigh up to 1800 pounds. That's a long way to come from 5 inch fingerlings. If you ever find yourself in West Central Ohio, consider taking a trip to pet a fish. Poachers Poisoned 300+ African Elephants With Cyanide For Their Tusks!